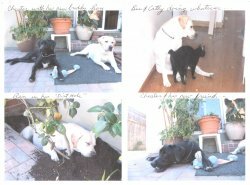 My pets get excellent care at Alta View. Dr. Paul Ghumman is an outstanding vet, and has treated my dogs and cats for the past 14 years. I appreciate that he always goes over test results, (such as blood work and x-rays) with me, so I understand them. 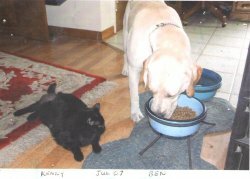 At least three of my cats and one dog have lived to 18 because they get such good care at Alta View. 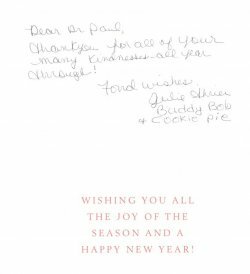 Dr. Paul always takes time to talk to me on the phone when I have questions or concerns, and has also called me to check on how my pets are doing after treatment. The office staff is very good and I can usually get an appointment the same day I call. 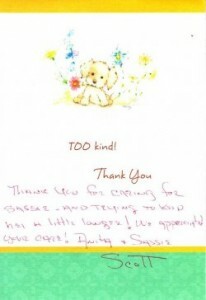 I recommend Alta View and Dr. Paul to anyone looking for the best care for their pets. I’ve been coming to Alta-View Animal Hospital for the past 15 years and am impressed with its helpful staff. The receptions are friendly and Dr. Ghumman is compassionate. He has successfully diagnosed my 3 dogs and helped them live longer lives. Every month I bring my basset hound in for toe-nail clipping, which they do kindly and quickly. Highly recommended! 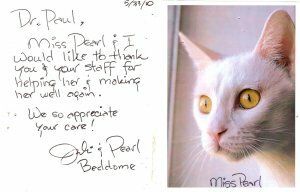 Dr. Paul has been taking care of my pets for more than 20 years, and I’ve been so happy with the care they’ve received. 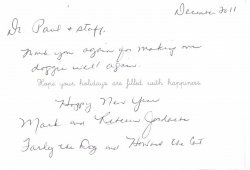 We have had every experience from the excitement of a new kitten or puppy to the sadness of saying goodbye to an aged pet…Alta View has been there for us and treated us well. There have been a few times when we’ve had an emergency, and we’ve always been seen promptly and with a calmness that’s been reassuring for the circumstances. Ok all you Yelpers I have taken my dog a shiba inu to Dr. Ghumman he diagnostic him with hemolytic autoimmune disorder. 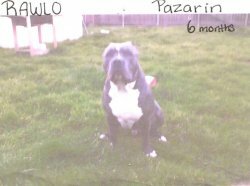 The other vets I went did know what my dog had. I went to Bainfield they had no idea they gave blood tests results but they were not specialists and Quito Vet OMG that vet said the dog is fine when he needed a blood transfusion. Have you compared prices with other vets in the valley. His vet vists are more resonable then most. –If you want top knotch service and you are a multi multi mulity billionaire by all means then go pay more money go to Adobe or another place. –Yes I have paid my share of vet bills here. But over all it is reasonable priced or match it. –Before you agree to extra services ask them what your bill is now so that way you dont’ feel chumped or you paid too much. No matter what is wrong make sure you know your bill before you agree. Remember Vets have a business to run and yes some charge way too much but you can’t have everything for free…. New to the area and looking for a vet. Referred to Adobe– they were rude on the phone, then couldn’t see my dog for a week, then canceled the day of the appt. Someone told me about Alta-View and I’m super happy with them. They saw us right away, Dr. Ghumman is professional, personable and caring. Highly recommend. Dr Ghumman and staff have treated all our dogs. By my count, this includes 9, 3 of which are alive today. At one time I thought Alta View was on the pricey side and a little disorganized. But after having to use 2 other vet clinics recently while on travel, I feel we pay a fair price at Alta View. We also get great service (make an appointment, like anywhere else). His clinic is now ‘open’ on weekends. Dr Ghumman is also very capable – and you see him just about every time you go in, so it’s not doctor-roulette when you bring in your animal like other clinics. The staff is excellent. Anyway – we love the down-home country feel with precise animal care. Like any business customer, we thought about going elsewhere / looked around and came to realize our pets were getting everything they needed from Alta View. From my experiences, Alto View Animal Hospital is worth a 5-star review. When I had my Labrador (god rest his soul), Dr Paul Ghumman was the sole veterinarian that I went to. From surgeries to normal check ups, Dr. Paul always let me know exactly what the issue with my pet was, and how we could remedy the situation. First of all, if you’re complaining about prices in regards to your pet’s health, then you should be ashamed of yourself. No one can put a price on a pet’s well-being, and with that said, you should never think twice about paying for your pet’s health. In addition, the prices that they charge at Alta View Animal Hospital are by any standard, pretty reasonable. There are no hidden charges, and everything is laid out according to each factor of your pet’s visit. With my labrador, I’ve brought him to Dr Ghumman for many years. Now I haven’t been to multiple vets in my time, but I know a good one when I see him. 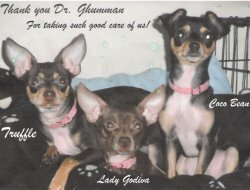 Dr Ghumman is caring with each individual pet. He lays everything on the table if there is an issue, and explains everything to the detail. No matter what the decision you may have, you can honestly be at ease because you’ve heard every fact and option that you can possibly take from Dr. Ghumman. Although I do live 15 minutes away from the hospital, and that there are plenty more within a shorter distance, I cannot think of any better place to take my beloved pet. People can say what they want about the insensitivity of the hospital and the ridiculous charges that they place on your pet’s care, but from my many years of interaction with Dr. Grumman, I don’t think my pet could be in better care. 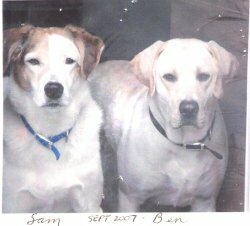 With that said, in addition to my labrador, I do have two other dogs that I would happily place in care of Dr. Grumman. 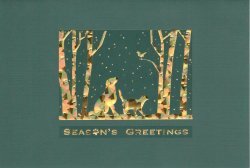 There is no reason that one should be reserved in deciding to take your beloved pet to Alta View Animal Hospital. 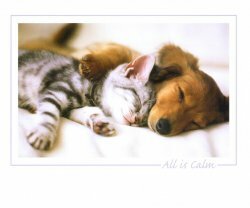 If anything, you can be at ease that your pet will be well taken care of. Dr Ghumman really cares for my pets. I appreciate the professionalism and kindness he has given my cat and dog. 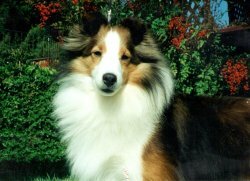 He understands that our pets are part of the family and guides us on the pet health care options. Ok so I had an emergancy with my little dog. ( she was having trouble breathing) And the vet here was fantastic. we did xrays, tests and an over night stay… all for about $200. 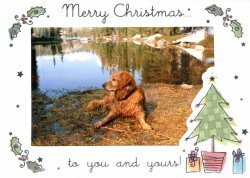 I have been taking my beloved pets to Dr. Ghumman at Alta View since 1991; I found the clinic after my cat’s leg was severely broken. I had first taken my kitty to two different local vets, who each told me my cat would have to be put to sleep, as the break was so severe. Upset and desperate, I found Alta View Animal Hospital. 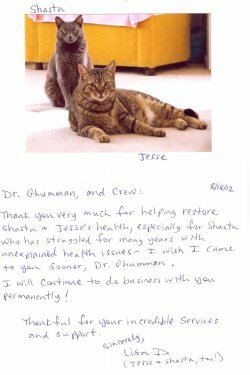 Dr. Ghumman examined my cat in his quiet, gentle and methodical way and told me he would be fine, put him in a cast with the proper meds., and my kitty was on his way to fine health and lived another 10 years. For nearly 20 years, I have always found the best care here for all my animals. Dr. Ghumman is always a calm presence, no matter the situation. I feel his skill, knowledge and empathy are the perfect mix for someone in his practice. 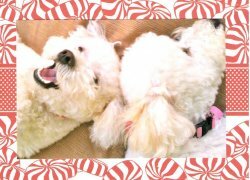 Their prices are very fair and lower than many other local vet offices, yet they provide the same professionalism, dedication and skill level as any vet office I’ve been acquainted with (I am a professional pet sitter and dog trainer, so have experience with a variety of vet offices because of my clientele). 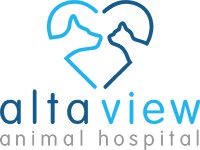 I never hesitate to recommend Dr. Ghumman and Alta View to my clients, family and friends. Those who have taken their animals to Alta View after my recommendation have all found their experiences to be very positive. The clinic has recently been remodeled, painted and updated and it looks wonderful! I have been going to Alta View for 6 1/2 years. 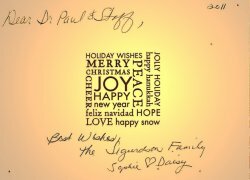 Dr. Paul is wonderful. When my cat has been sick, he takes great care of him, explains everything and even calls me at home to check on him after I have left. He makes sure I understand the medicine, the eating requirements, everything. Whenever I have called to leave a message for Dr Paul (thinking he is too busy for my call) he always gets on the phone! Amazing! He remembers me and my cat and always makes sure to ask me details on how he is doing. His office visits are very reasonable, as well as shots and medicine. He will always explain bills before doing any procedures if you ask. I moved 4 years ago and I am over 20 miles away and I still drive because Alta View is the best. Thank you to Dr Paul and the entire staff for your caring, understanding and great attention to details. Yesterday afternoon I discovered my cat could barely open one of her eyes and had goo all around it! So I called to make an appointment, and Alta-View had an available appointment later in the afternoon – even though it was 4 hours later, it’s still better than 2 days later, which was the case of the first place. I like how the location is close, parking is convenient. I arrived a bit earlier to fill out necessary paperwork. Staff was friendly, and I entered the exam room 5 minutes after my appointment and waited maybe another 5 minutes for the doctor. 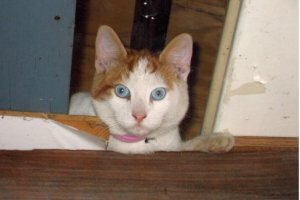 My cat was taken care of – I was informed of the fees over the phone, but on the sheet you fill out, it does say that if you want to know the cost of the fee or get a quote before the service is performed, all you have to do was ask. When I got the bill I was not surprised at anything, and felt it was reasonable for the services performed. I recently moved from Los Angeles, so I am happy to know that a clean and friendly facility and exam costs $29, and not $69(a vet I visited in los angeles…). Without the extra wait-time, I’d give it 5 stars~ since I think it’s reasonable to be seen at your appointment time. That’s 5 star service~ a 10-15 min wait gets 4 stars! Hope this helps! 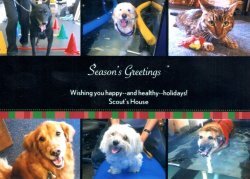 Dr. Paul and all the staff of this marvelous animal hospital are all absolutely fabulous. 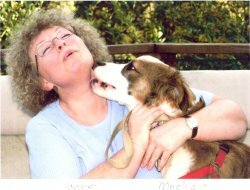 They are warm and friendly, knowledgeable and clearly love and care well for my 3 dogs. 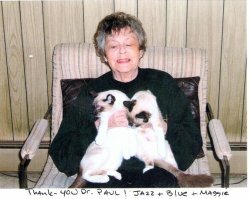 Dr. Paul is always available for a phone call and he is consistently warm and caring towards any and all animals. I have also boarded my “kids” with them on several occasions and they always seem well cared for and loved – and the staff is used to phone calls requesting status updates. I highly recommend this vet’s office! You people giving this place a bad rating must be crazy!!! A few years ago my dog had this really bad rash on her back, it was so bad that it will bleed from scratching it so much! 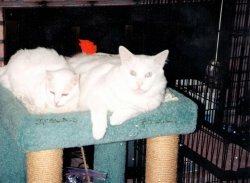 I went in search for a vet & I took her to the three of “best” places & they did nothing only billed me with $200 each! 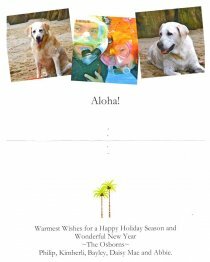 Finally I came across Alta-View animal hospital & they did the whole works on my dog. They scraped the rashed skin, cleaned it up, gave her antibiotics & this spray for it! They did all that for only $200! Finally I was happy that someone did something & no longer has she ever gotten that rash! I still go there & I will continue taking any of my feature pets there!! As of right now I am very happy with this place. It came recommended to me by a family friend while we were in the middle of a crisis when my cat fell three stories from our window. We took him to another vet to get checked out because he was limping, who sent him home because he would put weight on it. The vet at Alta-View said he constantly sees animals come in and put weight on broken bones, and would have x-rayed our cat. If he had been x-rayed when the accident first happened instead of a week later when we determined that the vet was wrong and he needed help. Because of this miss, our cat is getting surgery at Alta-View to fix his broken paw so we will see how it turns out. 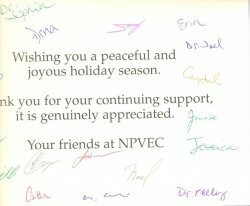 We spent 180 for the initial useless visit, then over 500 for the second visit to learn that they couldn’t do anything at my old vet. We were worried about the cost of further surgery and hospitalization of our cat, but the quote that Alta-view gave us was 1068 which was much less than we expected. It is true that the staff seems distracted and busy, but they didn’t keep us waiting (we went at 315 on a Monday afternoon) and the doctor was very understanding, experienced and well educated. The surgeon did seem a little odd but it does not worry me. It was odd that they told me to call THEM tomorrow, but oh well, at least its on my schedule then. Also, I didn’t really get to say goodbye to my cat before I left, they just kinda took him in the back to take a look at him, and then we were told to wait in the lobby. 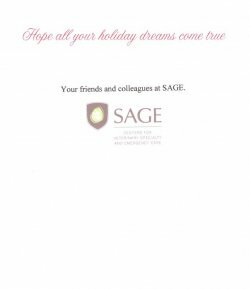 Its also nice they have such long hours! My experience has been really good so far, I shall keep you updated as our story unfolds! 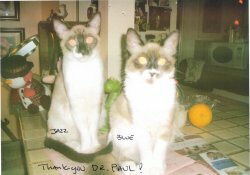 Dr. Paul couldn’t save Booboo my kitty, but he tried his very best. He was compassionate but also pragmatic. He gave much pro bono care during Boo’s 2 week illness. I have a new kitty now and will take her there as soon as she needs to go.